Published Jan. 7, 2014 by Imperial Beach Patch. As Imperial Beach watches Sea180 Coastal Tavern and Pier South Resort open, a smaller business with its own views of Seacoast Drive and the Imperial Beach Pier continues to grow. “I love coming to work. We’ve got the best view in the house,” said owner David Sandoval, who runs Barrels Wine and Beer steps from the beach, above Seacoast Grill and directly across Dunes Park from Pier South Resort. Imperial Beach didn’t really have a place to go for a glass of wine until Barrels opened, Sandoval said. Formerly Woodies upstairs and Beach Club Grille downstairs, John Haupt sold the business to William and Nick Awad for $700,000. Sandoval leases the space upstairs from Awad. Before selling the business, Haupt gave the second story a roof and new wood finish. Sandoval has made his own changes to the space. Sandoval made some immediate style changes, turning down the lights, adding more art and giving the space a lounge feel. “I’ve seen a lot of different bars and different wine houses and different things and it just needed something different around here. I wanted to make it a little more upscale,” he said. Barrels serves appetizers and dozens of wine and beer selections to teachers grading papers, Navy sailors on dates and a range of customer, Sandoval said. Sandoval also opened the bar to be part of a start of a resurgence in investment in the Imperial Beach waterfront, joining the Cohn Restaurant Group, Pier South Resort, Filippi’s Pizza Grotto and Coronado Brewing Company, who plan to open a Seacoast Drive location in spring 2014. And despite some empty businesses in recent years and a lower than average income per capita, condos on Seacoast Drive aren’t cheap; Imperial Beach does have money, he said. “People have it but they don’t spend it here because there was nowhere to spend it,” said Sandoval, who grew up in IB and worked at his parents 7-Eleven on 13th Street for decades. The new resurgence in investment has some ties to Coronado. Sea180 Coastal Tavern Executive Chef Ken Irvine and Filippi’s Pizza Grotto manager Michelle DePhilippis both live in the Coronado Cays. 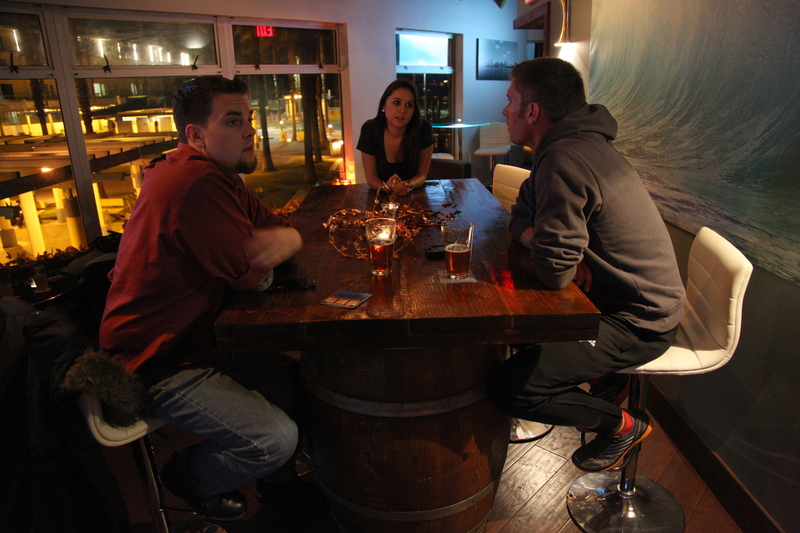 Ron Chapman of Coronado Brewing Company lives in Imperial Beach. A new upscale feel and more tourism should not mean IB loses its unique character or diversity, Sandoval said. Imperial Beach should become a destination but shouldn’t try to be Coronado Jr. Barrels is open 4 p.m. to midnight, seven days a week. Hours and seating arrangements are flexible. For more information visit barrelswineandbeer.com. This entry was posted on Sunday, June 22nd, 2014 at 8:47 pm. It is filed under Story Archive and tagged with business, Imperial Beach Patch, Seacoast Drive. You can follow any responses to this entry through the RSS 2.0 feed.